What does Windows 8 use for mp3 metadata? I've been trying to write a program to modify the metadata of audio files. I read that MP3 files normally use ID3 tags, however when I modify them, it does not change what Windows Explorer displays. This leads me to think that Winodws does not use ID3 for MP3 metadata. So, what does Winodws use? Or am I getting the wrong end of the stick here? Windows Explorer uses ID3 tags. Tag handling in Windows depends on Windows Media Player version. There are two major versions of ID3 tag format - v1 and v2. One file can have separate ID3 v1 and v2 tags. If you change ID3v1 tag only and there is ID3v2 tag present - Windows Explorer will show only v2. If you change tag with Windows Explorer - it will update both v1 and v2 tags. 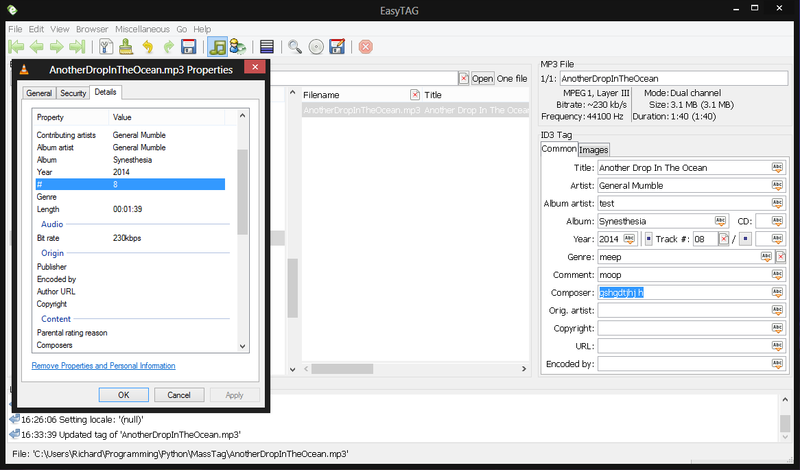 It looks like EasyTag application that you showing on screenshot works only on ID3v1 format or you have to reconfigure it to edit v2 tags. I think older WMP versions support ID3 tags up to ID3 2.3 version, ID3 v2.4 is not supported. Not the answer you're looking for? Browse other questions tagged windows-8 audio mp3 metadata or ask your own question. Check “Id3 Tag” integrity from mp3 (almost a “debug”). Is it possible? What kind of metadata can be stored in m4a files? How to use ffmpeg to join MP3s and copy the metadata at the same time?